Do you ever feel like choosing what to make for dinner is too much of a chore? Well, with hundreds of apps for foodies on the iPhone, you no longer need to stress. Planning and making dinner will take no time at all once you’ve downloaded these 10 apps that bring meal planning into the 21st century. Ucook – Over 60,000 recipes are provided with this free app, making choosing what’s for dinner a much easier task. There are some great search features, too, which will allow you to filter by region, preparation time and even by the equipment you have in the kitchen. You can also find all those essential missing ingredients with a feature that searches local stores. 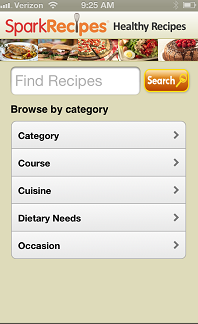 Allrecipes.com Dinner Spinner – Dinner Spinner is an iPhone app favorite. The innovative functionality takes all the work out of searching for recipes. You simply enter all the ingredients you want to use and the app returns a list of recipes for you to create. Still too much work? You can just shake your iPhone and Dinner Spinner will choose a random recipe for you. This app is highly rated and free to download from iTunes. iFood Assistant by KRAFT – Have you ever wanted to just look at an empty package and find out where you can get a refill? Well, with iFood you have the next best thing. A barcode scanner, voice or text search feature will source all your favorite foods in stores that have the items in stock. Once the free app directs you to all the ingredients you need, you can then utilize thousands of recipes to whip up a great dinner for the family. Healthy Recipes – Looking for a healthy approach to dinner? Use Healthy Recipes, another great free app available for the iPhone. Simple categories will guide you through recipes for your breakfast, dinner and summer salads. To help personalize the experience, Healthy Recipes has a completely customizable database where you can alter or create your very own recipes, too. How to Cook Everything Essentials – Based on world renowned chef Mark Bittman’s book “How to Cook Everything Essentials,” this free app is packed full of dinner ideas. Although there are only about a hundred recipes, each one has a number of variations, which gives you thousands of meals to experiment with. There are also a number of cooking guides that will help you source ingredients, time your meals and teach you advanced cooking techniques. Easy Recipes – No matter where you are, Easy Recipes has your cooking needs covered. The offline function means that you can access recipe ideas even if you don’t have full cell-phone coverage. The search function is clean and easy to use, so you won’t spend too much time looking for the recipes that you love. The app costs $0.99 and is available for download from the App Store. Epicurious Recipes & Shopping List – This app is a two-time winner of the ASME Award (National Magazine Awards for Digital Media). With over 30,000 gourmet recipes available for you to create, dinner will never be boring again. Icons and keyword search will help you find exactly what you’re looking for, and new recipes are automatically added to your device every day. This free app is absolutely brimming with other great features, so explore them at your leisure. Whole Foods Market Recipes – If you, a family member or friend has special dietary needs, then this is the recipe app you need to have on your iPhone. Whole Foods Market Recipes has over 3,000 recipes that you can filter by course, cuisine, special diet and more. Staying on budget is easy, too, with an intelligent cooking guides feature. This is another great free app for the iPhone. BigOven 250,000+ – In case you hadn’t guessed, this free app has an astounding 250,000+ recipes for you to try. Synchronize the app with a BigOven account to store all your created menus, leftover ideas and share your recipes with friends and family. The drag and drop feature is ideal, as you can quickly add menus to your meal calendar for forward planning. Martha’s Everyday Food – If you love Martha Stewart’s recipes, you’ll really love her new and improved app. For $0.99 you get recipe shuffle at the flick of a wrist, detailed video tutorials, and daily articles from Everyday Food editors. There is also a great shopping list feature, which allows you to easily add ingredients from any recipe.